Alfredo Morelos tonight received a three-match ban. That’s right, not two, but three. Now, we at Ibrox Noise had little defence for him even if Gary McAllister did – we believe it was a red card if not the most vicious we’ve ever seen, unlike the blatantly more dangerous one Scott McKenna was guilty of. 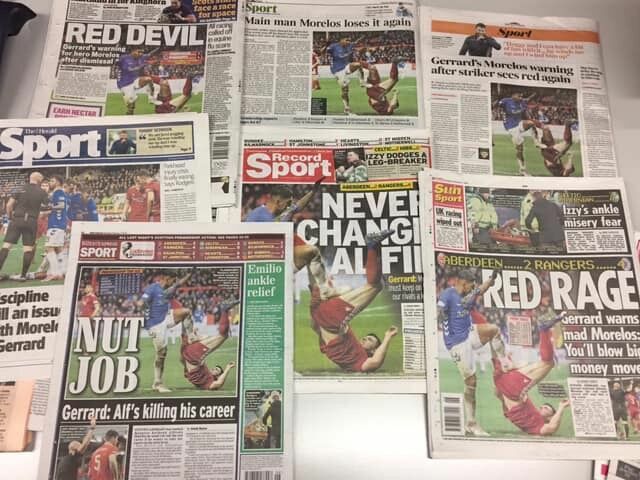 But Morelos had been widely speculated to get a two match ban if his appeal failed – and the Scottish media appear to have made sure the process was completely prejudiced from the start. To smear this 22-year old boy as a ‘nut job’ is a level of reporting which clearly violates the ‘legal’ process, affects due diligence and stops the appeal panel doing their job neutrally. The Scottish media tried and convicted Alfredo Morelos without any appeal panel even needing to get out of bed. We do agree that in our opinion on this site, and we speak only for ourselves, it was a red card – but the tainted procedure behind the appeal process influenced by headlines determined to have a young man executed for his crime of over-zealous physical conduct is much more damning than anything the Colombian did. 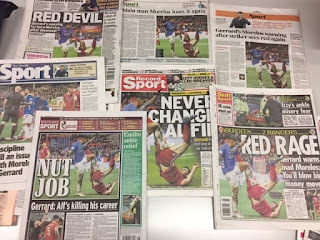 Scotland’s media made sure Rangers lost out on Alfredo Morelos – we’re not naïve enough to suggest he is innocent – he is not. But the media sure as heck closed the deal. The compliance officers office is in BBC Sportscene.Judge jury and executioner starts their and then the rest of cabal take over. Where is Walter to give them an interview. Firstly i'll state here and now, that alfredo morelos is a fabulous striker, with a very big future in the game,if he can cut out the naughty side of his game.Our manager steven gerrard,needs to have a very serious talk with alfredo and without taking the edge away from him, has to try and knock the stupitity out of his game.He's absolutely no use to rangers sitting in the stand every other week or so.We as supporters can't keep overlooking this and saying refs have got it in for alfredo, because the truth is,that alfredo himself,is bringing it on himself!He's close to becoming a luxury liability,that we don't really need.His value to us when he's on the park,is there for all to see.He's without question won us games and is easily the best striker in scotland,bar none.He's also costing us games,with his suspensions.The club is bigger than any individual and if this indiscipline continues,gerrard will have to weigh up, whether its worth keeping alfredo.I really do hope that gerrard can find a solution and get morelos to cut out this self destruct button he has. Some do slip through alas. Removed. He could do with spending some time with coisty. If he could pass on some of cheeky chappy personality it would help Alfredo and drive everybody in scotland insane! Leave the young guy alone. He'll sort himself out as he gets older. Luis Suarez! If it had been any other player in Scotland he would not have been sent off. However stop buying the gutter press. No more, press interviews. Especially to the Scottish red-tops, who helped this 'trial by media' BS. The bias, is un-deniable. It was 50/50 for me, this whole incident. But the way the press/SFA and greetin-face Clarke/McInnes have colluded, to punish our player MORE than the normal, disgusts me. Time for the board to give the nod. How to hurt a newspaper, strangle it's air-supply, Stop giving them copy. If we don't, this climate of anti-rangers bias, will continue. I.N. Please, please, please use your platform to highlight the facts of hatred portrayed towards our club and fans from pundits,managers,journalists,players,fans etc. It is truly beyond acceptability and one example of many is on a day when a complete low life associated with another club gets found guilty and jailed for a despicable crime the BBC gives it under 2minutes coverage and yet the morning after a thrilling encounter at Sheepland when 2 players were quite rightly shown red cards all the rags destroyed Alfredo and hardly a mention for McKenna who tried but failed to hurt Alfredo. As said this is one of many instances of hatred and bile publicly shown to our club. As Mr Souness quite rightly said "No-one likes us we don't care" and created a siege mentality. I really hope I.N step up and voice their opinions based on facts(and there are many)on the nasty,hate filled sentiments and bile being bestowed upon our family daily. We all need to create a SIEGE MENTALITY but platforms like I.N can get the message across quicker.